If you are looking for a unique, unforgettable and relaxing honeymoon, Sicily and Aeolian Islands will be your perfect destinations. A mix of history, nature and relax. Pamper yourself in the sun and blue sea of the Mediterranean islands! 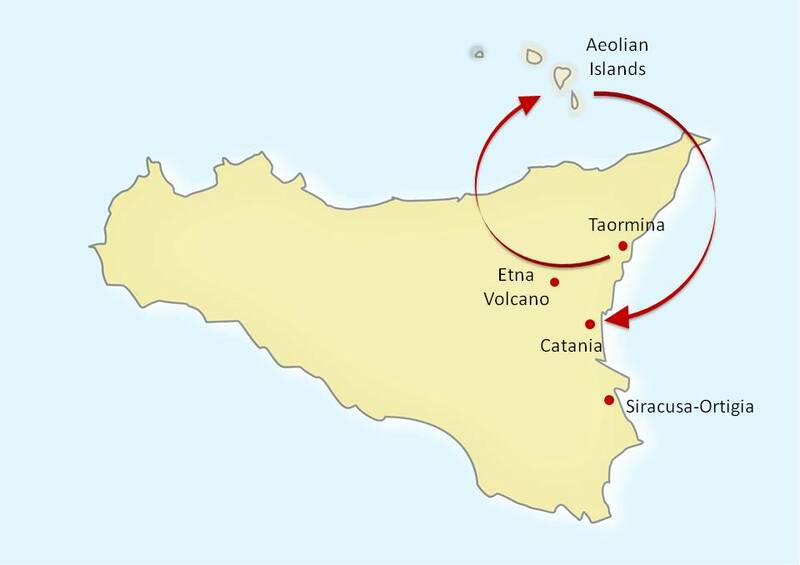 The Tour features Taormina, the Etna Volcano area, Siracusa-Ortigia, the Aeolian Islands and Catania. Explore the Greek and Roman ruins in Siracusa and Taormina. Sail amongst the “Seven pearls of the Mediterranean Sea”: the Aeolian Islands. Enjoy the thermal waters of the islands and swim in the blue water of their natural pools. Get fascinated by the picturesque volcanic islands scenery and by the little eruptions of the "Lighthouse of the Mediterranean": Vulcano Island. Stand on the roof of the majestic peak of Europe’s largest active volcano’s craters: the Etna. An experience of a lifetime! 10 Nights accommodation in exclusive and fascinating 4 stars sup. Hotels with full buffet breakfasts: 5 Nights in Taormina, 4 Nights in Lipari (Aeolian Islands), 1 Night in Catania. Welcome Honeymoon Package at your arrival in each hotel. Romantic Farewell Dinner in Sicily. Private sightseeing walking Tours with expert local English speaking Guides, including the entrance fees avoiding waiting lines in Taormina (Greek-Roman Theatre) and Siracusa (Archeological Park). Full Day Excursion with private jeep and English speaking guide on the Etna Volcano. Etna winery visit + Lunch with wines pairing. Full Day Excursion to Siracusa-Ortigia. Hydrofoil tickets Milazzo-Lipari and return. All private transfers by deluxe van with English speaking driver, available for transfers and excursions (including airport transfers). Tour begins and ends in Catania. Enjoy the magnificent views of Taormina from its amazing position of almost unique beauty. Private guided Tour of the city including the Greek-Roman Theatre - one of the most striking monuments of antiquity - the public gardens with its huge variety of plants, and the other monuments of the city centre. Fun experience on the Etna Volcano with you private driver: stop for wine tastings and delicious Lunch. Pamper yourself in Taormina and enjoy romantic sunsets over the picturesque mountain scenery. Full Day excursion with a private Guide to visit the beautiful town of Siracusa, once the most important competitor to Athens. Stroll amongst the streets of Ortigia, the ancient part of the town beautifully set on the sea. Tickets for the Archeological Park included. Relax yourself in the beautiful beaches of the Aeolian Islands, also known as the “Seven pearls of the Mediterranean Sea” because of their extra-ordinary beauty. 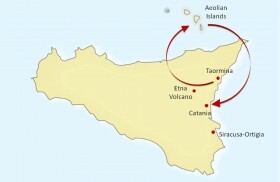 The present shape of the islands is the result of volcanic activity over a period of 260.000 years! From Lipari, the most lively of the islands, you will have plenty of opportunities to explore all the Aeolian Islands: sail to the Island of Salina and swim in the beautiful Bay of Pollara, stop in the port of Santa Marina. Swim in the blue waters of the Venus Pool and visit the “Cavallo” Grotto in Vulcano Island. Visit the “Fossa” crater (400 m) and observe the activity of the main crater. Enjoy the thermal waters and the mud of the island. 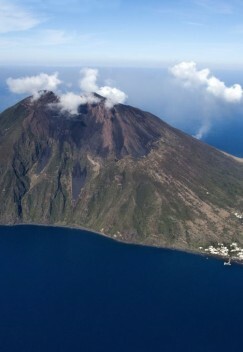 In Stromboli Island there is a volcano constantly active with minor eruptions, often visible from many points on the island and from the surrounding sea, giving rise to the island's nickname "Lighthouse of the Mediterranean". A significant geological feature of the volcano is the “Sciara del Fuoco” ("Stream of fire"), a big horseshoe-shaped depression generated in the last 13.000 years by several collapses on the northwestern side of the cone. Two kilometres northeast lies Strombolicchio, remnant of the original volcano and also known for being the inspiration behind “Mordor”, from J.R.R. Tolkien's “Lord of the Rings”. Last but not least, one of the most beautiful and rich in history city of Sicily, Catania. You cannot miss the central Piazza Duomo where you can admire the symbol of the city, the elephant fountain, or “Liotru”, as it is called. Visit the Roman Theater, near Piazza San Francesco, lately restored. Delicious farewell Dinner in the city centre.